Barbara Ross has been entertaining us with the Maine Clambake Mysteries since 2013, when “Clammed Up” was first published. “Clammed Up” received an Agatha nomination for Best Contemporary Novel, along with several other honors. Readers loved its engaging characters set in the world of Maine Clambakes and summer tourism. Let’s not forget the delicious murder that set the tone for the dastardly deeds in every book since. The books are (mostly) set in fictional Busman’s Harbor, Maine, and Ross does a great deal of research to support each storyline – including the character of the island itself. The Morrow Island of the series was created in Ross’ mind – not based on any one of the 4400 coastal Maine islands – but after the series was well under way, a friend sent her the link to an actual island for sale that incorporated many of the features she had invented for her stories. Check it out and see if your imaginings match the real estate photos. In real life, Ross lives part of the year in Boothbay Harbor, Maine, with her family, but does not run an inn. Her mother-in-law owned the Seafarer Inn for a number of years, and when she retired, Barb and her husband bought it to use as a summer home. There are no paying guests anymore. Barb shared that she can be seen busily writing away on the big porch in good weather. Barbara contributes to two blogging groups: Maine Crime Writers and New England-based cozy writers at Wicked Cozy Authors. Take a look at a recent blog post from the Wickeds, where she chats about her thought process for Morrow Island. One of the many fun parts of the series is the food mentioned in passing as lunches, dinners, or snacks. The recipes for these mouth-watering sounding dishes are included at the end of each book. Several were created by Barb’s husband, Bill Carito. I suspect that Julia’s hunky boyfriend’s wonderful cooking skills are patterned after Barb’s husband’s substantial talent in the kitchen. One of my favorites is the lobster mac & cheese – recipe at the end of “Clammed Up” – which I’ve made several times. Yum, yum, YUM! Pumpkin Whoopie pies, the official state snack of Maine. With its multi-dimensional ensemble cast, perfectly wicked guest villains, wonderfully researched plot lines, surprises galore, and the always fascinating look at life on an island dependent on outside cash to keep it going, we are happy to read as many Clambake mysteries as Barbara Ross can write. Book #6 is “Stowed Away,” coming in December 2017. Read review of "Clammed Up" here. Read review of "Musseled Out" here. Read review of Agatha nominated "Fogged Inn" here. “Drizzled with Death” opens as Dani Greene temporarily escapes the holiday mania afflicting her family. She catches up on work in the sugarhouse at Greener Pastures maple syrup farm, annoyed at being ignored at the age of 26. She is the youngest in the family, and at less than five feet tall, she finds it hard to be taken seriously, despite her business savvy that has transformed a family hobby into a thriving business. If being dismissed by the Game Warden isn’t enough to make Dani spit maple syrup, the next day at the Sap Bucket Brigade annual fundraiser pancake breakfast, a contestant pitches face first halfway into the seventh syrup-dripping stack of pancakes. Death by pancake? I’d be pitched over after the second stack, but that’s just me. Graham Paterson reveals that a truckload of exotic animals has been released and are running all over the area – caused by a talkative parrot. You have to read “Drizzled with Death” to find out how the parrot is involved. There are some really funny scenes that involve chasing wacky animals with nets and LOTS more. There is a great deal to recommend in “Drizzled with Death,” not the least of which is a very engaging Dani, and the relationships with the ex-boyfriend and the Game Warden. Dani uncovers some skullduggery that affects the area, and particularly Greener Pastures’ livelihood. She needs to uncover the culprit/motivation before the family name is ruined and before she winds up dead herself. There are zany characters with hidden agendas, decidedly wacky animals, and a clever subplot that will keep you intrigued to the end. Crockett has a witty way of turning a phrase that reminds us how funny life can be – after we have survived the crazy, of course. Happily, there are also recipes at the end, including a concoction called “Who’d a Thunk It.” It’s a sandwich created with an apple, bacon, waffles and maple syrup. Me, oh , my, doesn’t that sound like a delicious combo? “Drizzled with Death” is the first book in the Sugar Grove series. There are two later books, and hopefully, more to come. Please visit www.jessiecrockett.com for information about Jessie Crockett’s other books as well as her work with the Wicked Cozys. Sarah Winston is back in “The Longest Yard Sale,” the second installment in Sherry Harris’ habit-forming Garage Sale Mysteries. In addition to conducting her usual private home tag sales, Sarah has taken on the enormous job of running a one-day, town-wide event. And almost everybody has a great time. Including the thief that steals a valuable painting from an art studio belonging to Sarah’s friend, Carol. Law enforcement is focused on putting out fires as well as the Yard Sale crowds, so they don’t have quite as much fun. Art theft? Fires? 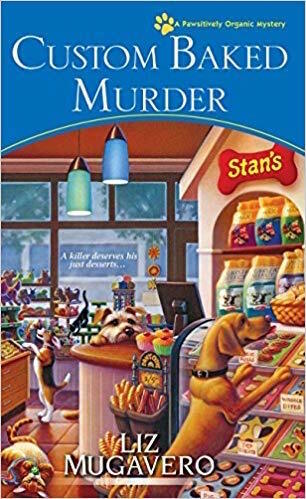 Add in a murder, a mayor who is never where she’s supposed to be, embezzlement, possible forgery, a ‘framed’ body discovered the day after the theft occurs, and we have a great mystery that intrigues and satisfies. Why was the body found at Carol’s studio? Is the body connected to the theft or merely a wild coincidence? And, what’s really going on in that studio? CJ, the Chief of Police and Sarah’s ex, warns Sarah to stay out of it, but she can’t help herself. She needs to collect information to save Carol from being prosecuted and her own reputation from being smeared. There are plenty of suspects to go around in “The Longest Yard Sale,” and Harris deftly deals with throwing suspicion in all the right places while the layered plot unfolds. Although Sarah has divorced her former Air Force husband, she still has ties to the local Base and the thrift store there, and maybe even to said hubby, CJ. Just because she now has to be buzzed onto the Base to gain access to the thrift store (and a possible new crime) Sarah’s interest in getting to the bottom of the bargain bins and ferreting out suspicious scams never wanes. Life in and after the Air Force is further explored in “The Longest Yard Sale,” and all is not as it should be. One of the subplots discusses a normal real-life pre-retirement activity: officers that use military connections to help set up post military life. In this case, people may have lost money in the process, but were they actually swindled? How? By whom? There is a new guy in Sarah’s life, but is CJ still in the picture as well? She struggles with why she was so quick to believe the worst about him and so ready to divorce. Harris creates a believable mental tug-of-war for Sarah, with CJ and the new guy playing strong male roles, each unaware of the feelings that Sarah may have for the other. An interesting balancing act that adds another layer to the tale. Which guy will she choose? Will she wait too long to make that decision? Does she need to make any decision at all? The great dynamic between Sarah and the men in her life, the nicely developed cast of characters, the twists in the engaging plot(s) in “The Longest Yard Sale,” all drive me to one conclusion: can’t wait to see what happens in the next book! Harris’ debut novel, “Tagged for Death,” an Agatha Award nominee, is reviewed here. Julia Snowden is back in “Musseled Out,” the third installment of Barbara Ross’ great Maine Clambake Mystery series. The Maine summer tourist season is winding down and it’s time for Julia to make a decision. Should she stay around until the next season to help the family with the Snowden Clambake business or go back to her venture capital job in New York City? Her boss will only hold her spot open for so long – just until the end of the week. She’s got five days to choose between two jobs and lifestyles that could not be more different. Now that the family livelihood has been saved, about the only thing that really holds Julia to Busman’s Harbor is her boyfriend, Chris. But, is that relationship really just a summer fling? Can she count on him to hang around? Is his constant disappearing act over? In a half-hearted attempt to force herself into making a decision, she looks at places to live in town. She doesn’t like the apartments she’s seen, and her boyfriend’s cabin is a little rough (translation – gutted while being rehabbed) for her taste. Plus, she has to find work in the off-season. Is that a sign? The thing is, as in any good series, there has to be motivation for the out-of-town main character to hang around. We don’t want Julia to go anywhere, so Ross has to give this smart, savvy gal in “Musseled Out” an authentic reason. How about the body of a potential competitor, David Thwing, tangled up in the lines of a lobster boat she sees drifting off her beach? Julia has helped the local police successfully before, so they trust her not to be involved in Thwing’s death, but there are plenty of people (including her brother-in-law) in her circle that could have done the deed. What follows is a beautifully crafted plot, with surprising twists and turns, and impeccably placed events that foil the bad guys’ plans. There is even a page-turning rescue scene that left me stunned, with the life and death struggles reading like an actual Coast Guard response. Ross has developed the core characters of the series even further in “Musseled Out,” giving Gus and Mrs. Gus a storyline of their own that affects Julia and Chris in a profound way. The book not only explores what happens when key personnel in a family business are sidelined, and the serious decisions that must be made, but also how bad decisions can wreck havoc on the lives of everyone involved. Read the review of “Clammed Up,” the first in the series, here.